I am a firm believer in the freedom of speech. I also firmly believe that freedom includes the freedom to speak out against the President and the American Government in general, without fearing retribution. Of course, there are a zillion Americans who disagree with me; remember what happened to the Dixie Chicks? And all they said was they were ashamed to be from the same state as George W. Bush, not that he was anti-American. I hate to say it, but you might want to consider watching your back, Cyndi Lauper. 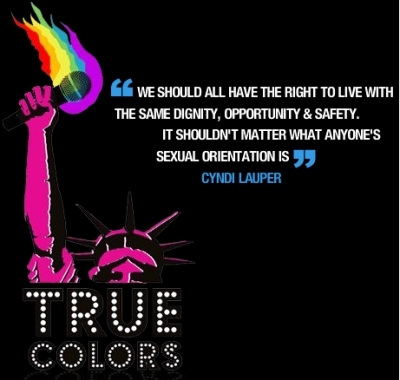 During a stop on her True Colours tour recently, gay rights advocate Cyndi Lauper blasted President George W Bush, calling him homophobic and anti-American. The True Colours tour was organised to raise awareness of homophobia and gay rights. 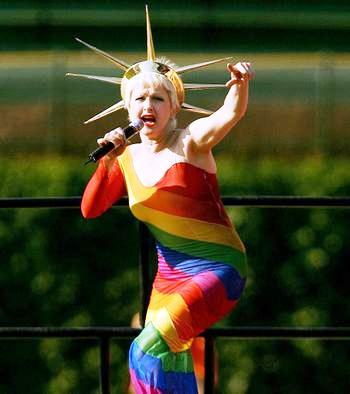 … “I have been running with this community all my life,” Lauper said, “and when I hear people like George Bush talk about the gay community being anti-American it makes my blood boil. “The guy who saved the White House, one of the heroes who crashed that plane on 9/11, was gay – the rugby player Mark Bingham, who died on United 93,” Lauper continued. P.S. Have you noticed how it’s getting harder and harder to find someone who will admit that they voted for George W. Bush? I mean, the guy won, so there’s got to be people out there who made that happen. Where are they? Hiding under a rock, apparently. previous post: Olympic Rules In Beijing For The Olympic Games. next post: Paris Hilton Would Paint The White House Pink. 50 queries in 1.119 seconds.